Wow this series! I have recently become obsessed with Downton Abbey (as has my husband- hurray!) The Grand Tour series hints at this same glamorous time. I love reading about the clothing, the settings, and even the details of the food they eat. The author has a fantastic way of describing the surroundings of Cora without info dumping. I love that she has created this world of characters who both infuriate me and crawl their way into my heart. Will and Pierre- whew! Bergren is a MASTER of the love triangle. I was in love with the triangle in her River of Time Series and this one is no disappointment. Typically it is obvious to me who the main character will end up with or perhaps one of the males is flawed in some way. Both Pierre and Will would be excellent for Cora. I loved reading the scenes between the three and I honestly can't decide who I want her to be with. Oddly enough, one of my favorite characters is a minor one- Hugh. He is ornery, funny, and slowly becoming one of my favorite characters in the series. I really do hope he gets more page time in the third book. 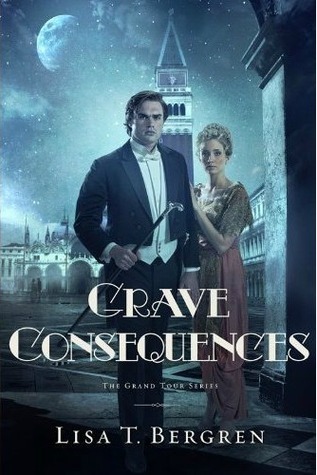 Grave Consequences was fast paced and thrilling. I can't wait for Glittering Promises this fall! I'm so excited for the release of this second book. I definitely adored Will in book 1 but am interested to find out how my perspective will change.